I order from this place often because they have a bean curd sub-menu with vegetarian versions of popular Chinese dishes. I like the General Tso's tofu. Their veg egg foo yung is also good. And you can order online through BeyondMenu which is convenient. My only gripe was a recent order that took WAYYYY too long and the staff just kept saying "It's on the way" rather than apologize or offer a refund. That really put a dent in my appreciation for this place. I don't order from them as often now. Had Chinese delivery ... sweet and sour chicken had raw dough, crab Rangoon’s weee underdone, also with a bunch of crunchy stuff but not visible crab ... egg rolls were underwhelming. It’s one and dine for me. Super fast service, hot, tasty food. Two dishes and two servings of soup for under $20. I would happily order from here again. I love their food. I call in the order and 15 minutes later it is hot and ready to go. Could go for delivery but pick-up is easier for me since they are just up the street. They offer a large variety of food to choose from and the portions are generous. I highly recommend. This is carry-out, not a sit down. However, they do have one table and a few chairs I guess if you would like to eat there but they don't serve you. They have many regulars that patronage them. Every time I go there is a regular who walks in and says nothing, the girl just says there you go and they are on their way. 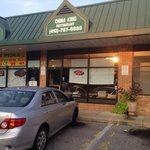 I have been eating at the China King since it opened. The prices are very reasonable and the portions are large, were else can you fed three people for under $20 and have leftovers. I really like the Generals Chicken and steamed dumplings. The wonton soup is always good and you can't go wrong with the vegetable lomein. Carryout or delivery only, there is only a single table in the entrance or waiting area. The waiting area could use a like" sprucing up" it a like cluttered and worn. Been to China King? Share your experiences!